A photographer views the guests from her computer screen. Three of my galas this past year have had professional portraits offered on-site. 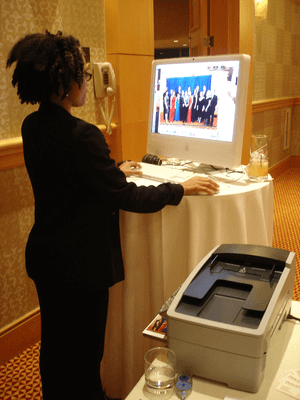 The photo offers guests a remembrance of your auction fundraiser. Portrait photography works especially well for an auction gala which has co-workers attending, such as corporate and hospital foundations. Guests look spiffy, so the photos show employees in their best light (all the better, considering those photos may show up on the company intranet). Portrait photography works for four reasons. 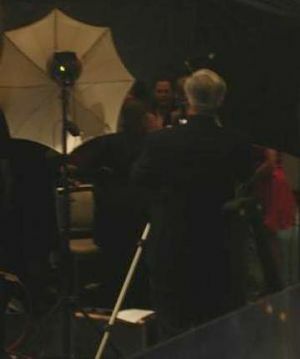 The photographer prepares to photograph colleagues at a college foundation gala. The activity allows company departments and teams of co-workers to have their photo taken together, which is a nice touch. A photo with a traditional background seems more professional with your co-workers than, say, a backdrop of of Las Vegas. The photos allow for more flexibility later, such as if the company’s foundation wanted to include a photo of the work team in an issue of the company newsletter, or even in a proposal for a prospective client. The finished shot can be used for business cards, the external company website, personal holiday cards, etc. We all prefer to be photographed when we look our best. The photography station is typically set up near the entrance to the silent auction. The photographer will show guests where to stand and offer basic instructions to capture the best angle and shot. For group photos, the photographer often takes a hands-on approach to ensuring everyone is in the photograph. Guests are given a 4″x6″ photo, often housed in a cardstock black frame. The developed photos are displayed on a table near the check-out area so guests can take their photo as they leave. Photos with groups of people are developed multiple times so each person in the photo can take a copy home. In short, this is a good activity for auction fundraisers and has the big perk of ensuring you can use those photos in other ways after the gala is over.